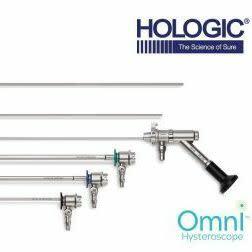 MARLBOROUGH, Mass.-- Hologic, Inc. (Nasdaq: HOLX) announced today that it has received a CE mark in Europe for its Omni™ hysteroscope, an innovative three-in-one modular scope with advanced visualization capabilities designed for both diagnostic and therapeutic hysteroscopic procedures. Obstetricians and gynecologists (ObGyns) can use the new Omni hysteroscope in out- and in-patient settings. Premium MyoSure optics for quality visualization and clarity throughout the procedure. Sheaths designed with smaller diameters (3.7 mm diagnostic sheath; 5.5 mm operative sheath; 6 mm operative sheath) to reduce dilation required and promote patient comfort and easy insertion. Long 200 mm working length facilitates easier access and treatment for obese patients. Simple assembly and disassembly so sheaths can be changed out easily between procedures. Operative sheaths can be used with Hologic’s Aquilex™ hysteroscopic fluid management system. Compatible with all MyoSure® tissue removal offerings including MyoSure REACH, MyoSure XL, MyoSure LITE, and MyoSure MANUAL devices. 2. Omni hysteroscope Instruction for Use. October 2018.